This year's Pixar flick sees an old man pack up and go to South America on board his house - floated with the help of thousands of balloons. Accompanied by a little boy, they explore far-off shores where not everything is as expected. Of course it turns out well in the end. Combining a lovable if beleaguered old man with an obnoxious little boy and some strange animals works well, even if the story line is a bit uneven. Not up there with Ratatouille, but worth watching. Devastating Earth -especially by natural force- is something rarely seen, but director Emmerich is up to the task. The scenes were whole megacities are swallowed up by suddenly opening volcanic rifts are spectacular. The last hour or so is a bit predictable, and reminds the viewer of The Poseidon Adventure, but by then the Earth is toast, by and large, and who survives really doesn't matter much. Once again, an action film that leaves out those pages of the underlying novel that explain why in the remaining pages there's running, shooting and killing. Ewan McGregor? is kind of an odd choice for a senior clergyman close to the Pope, but as it turns out, he brings to the movie exactly those action qualities that he exhibits in his other films. As to the church and religious history that provides the motive of it all, Tom Hanks has a tough time explaining it all, chiefly because he's either running someplace, or staring at something while furrowing his brows. It's OK entertainment, but watching it a second time is not tempting. 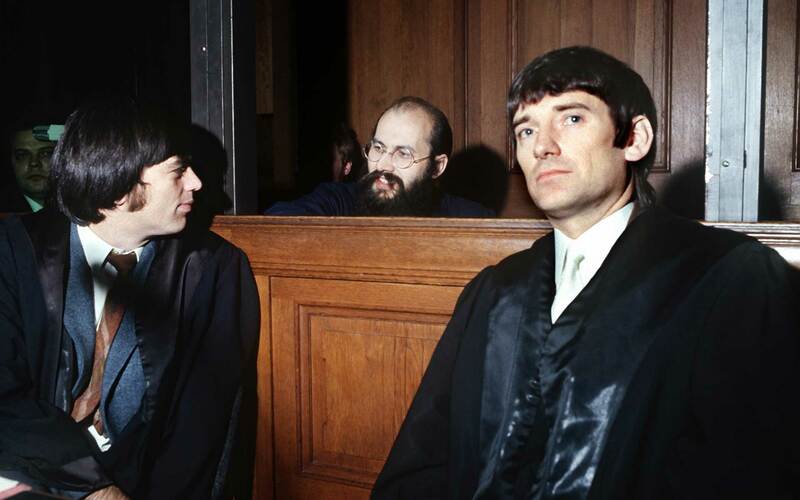 Christian Ströbele, Horst Mahler and Otto Schily were lawyers in post-war Berlin, and became involved with the student protest movement. Mahler went so far as to join the terrorist Red Army Faction, and -much later, after spending time in jail- is now close to right-wing movements, while the other two were defending lawyers of students and terrorists, and became early activists of the Green Party. Schily went on to become Secretary of the Interior, while Ströbele is a now an MP. All three talk candidly about their experiences, lessons learned, and their view of society back then as well as now. It's a fascinating glimpse into the minds of prominent figures who can rightly be called "movers and shakers" (for better or for worse). It's a dark time for children a few years before WWI in a rural German village. It's a tough life for adults, too, most of them dependent on a local nobleman who supplies them with agricultural work. In an environment of hardship and repression, strange and violent things start to happen, and the culprit is never found. Part of the answer seems to lie with the children, but, what, exactly, has happened is never made clear. The film paints a disturbing picture of life in the village, and the viewer is left to ponder how close to reality it is, or could have been, thus the movie provides a lot of food for thought. The shutting down of a clothing factory begs the question of what the former employees are to do with their severance money. Start a new business? Or pay a hitman to kill the owner of the factory? Having decided on the latter, the most hapless killer in history is hired to do the dirty deed. Many obstacles pop up, and much situational comedy ensues while overcoming them, along with a good dose of wackiness. For friends of out of the ordinary films. This film-in-a-film shows a seasoned movie actor trying to come to grips with aging, an ex-lover now linked with the movie's director, the consequences of his alcoholism, and a potential replacement actor who's breezing down his neck for a chance at a big movie part. Although these ingredients could have resulted in something heavy, this movie manages to do it in a light and entertaining style without belittling the issues at stake. Good summer entertainment with the potential to keep you thinking afterwards. This movie about a group of Jewish-American soldiers (the "basterds") wreaking havoc amongst Nazi soldiers behind the lines in occupied France during WWII is carried by a fantastic performance of Christoph Waltz, who portrays a German colonel hunting the group; he rightly won the acting award at Cannes for the role. (German viewers might remember him as a slightly off-beat physician in Herr Lehmann a.k.a. Berlin Blues.) The film is partly violent, partly wacky and partly comedic, and it rewrites history by having the entire German army and Nazi high command killed in Paris. In short, solid entertainment with one outstanding acting performance. This documentary based on Nobel prize winner Eric Kandel's life is as much an introduction into his work (neurobiological research into the workings of the human brain, particularly memory), as it is an attempt to trace his roots from pre-war Vienna (which his Jewish family was forced to leave) all the way to Columbia University, the home of his lab. Kandel is a fascinating and entertaining character, and the film lives by his extensive involvement in front of the camera. Chosen as evening entertainment on a very rainy vacation day, this one proved to be very funny. It's the story of four friends who go to Las Vegas for the bachelor party of one of them. The movie starts with the morning after the party, when it becomes apparent that things didn't go smoothly, one of them is missing, and nobody can remember anything about the previous night. So they try to retrace their steps, find out what happened, find their friend, and do it all in time for the wedding. Of course, further complications ensue. Very good entertainment indeed. Fast-paced action thriller in which Liam Neeson chases down the kidnappers of his daughters with a take-no-prisoners approach that leaves scores of people dead in his wake. Although it's good entertainment, it all becomes a bit too much when the grand finale pits him against a boat full of heavily armed people brandishing automatic weapons. A lame attempt at an explanation is made by hinting at his past (some sort of supposedly "good" CIA agent), but the details are sketchy and ultimately don't matter much: either you suspend disbelief and go with the flow, or you're not going to have much fun. A couple runs into all the problems that can possible occur on the first vacation together: insecurity, dealing with dashed hopes, diverging attitudes, chance encounters with distant acquaintances and more. In the two protagonists, the movie looks at two different approaches of how to deal with it all. Strong performances -especially by the female lead, Birgit Minichmayr- help to pull it off; a few scenes would have benefited from some cuts, though. An investigation of a corrupt police force and a love story between the investigating DA and one of her targets who is turned good cop, set in pre-Katrina New Orleans. Neither the antics and heroics of the officer himself, nor the romantic angle are really believable. I had been keen to watch this, but apparently had got something mixed up, since this movie misses the mark. Jim Jarmusch once again sends a man on a journey, much like he did in Dead Man and Ghost Dog, only this time it's a hit man who picks up clues that allow him to proceed from various contacts he meets along the way. Even though the hit is ultimately executed successfully, the main part is the journey, and that remains mysterious. What's the point of his contacts trying to engage him in discussions on various matters like culture, language and science? Why does he consistently deny speaking Spanish although he understands it? With this film, stylish as it is, beauty clearly is in the eye of the beholder. This adaptation of Heinrich Böll's eponymous novella tells the story of a young man, who -although successfully settled in his job, and engaged to be married to his boss's daughter- leaves it all behind when he meets a young woman from his home village (who he knows from years ago) who is about to settle in the city. Although the man's motives eventually become clear (an unhappiness with his situation, once the immediate needs are met - especially for bread, which was lacking when he grew up), the woman remains mysterious in her aims and general outlook. The narration jumps back and forth in time, and mixes in third person accounts of what happens as told by acquaintances. The film provides an interesting look at Wirtschaftswunder Germany, though, especially Berlin, where the film is shot. Clint Eastwood is at it again, with all the humanity of Dirty Harry, sneering down everyone and everything he doesn't like, which includes his family, his neighbors and much else besides. But even though decades of practice have left him a misanthrope, this starts to change when he's forced to engage with his immigrant neighbors, tries to apply his Mid-Western values to them (the attempts at which include various guns of his), but finds himself powerless to their humanity that's so different from his. It's subject to debate whether the film has a happy ending, but it's a surprising story well told, and it touches on some deep questions about who we are as individuals, where each of us is headed in the short and long term, and how we're going about it. This documentary tells the story of WikiPedia:Wolfgang_Lotz, a German-born Israeli who spied on Egypt during the 1960s, especially the rocket program that was aided by German and Austrian scientists. The film intersperses much original footage (even from the Lotz family's 8mm) with interviews with his son, his friends and acquaintances, and even the Mossad operatives that controlled him. The picture that emerges is less about spy tradecraft than about the human cost inflicted on his family, his friends, and ultimately on himself. It's a fascinating glimpse into a side of espionage that's rarely mentioned. Wolfgang Neuss was one of the preeminent satirists and comedians of post-war Germany. Becoming more of a thorn in the side of society on the Sixties, and a drug addict in the Seventies, this documentary chronicles his life and career all the way to his death of cancer in 1989. Plenty of interviews with Neuss himself (made just days before his death) and his family and friends, as well as excerpts from his films and shows, provide a well-rounded picture of a man who, above all, was always true to himself, and had a remarkably unclouded view of what exactly that self was. This movie from 1952 is set in the war-ravaged Berlin, where a gang of currency counterfeiters have continued the Nazi-started operation of printing US dollars. Memorable shots of Berlin abound, showing both the parts that survived as well the ruins of those that didn't - from a murder at the top of the radio tower, through a car chase that ends by the chased driving into the Soviet zone, all the way to the finale in the burnt-out shell of the Reichstag. The movie recounts the Cuban missile crisis from the perspective of the US government. As such it shows how the administration suffered from infighting and differences of opinion between the Kennedy brothers, their advisers and the armed forces; central figure is a special adviser to the President played by Kevin Costner. The film doesn't have many qualities to recommend itself, but it does serve as a reminder of how the instincts and objectives of the armed forces need to be carefully checked by their political superiors - echoes of 1914 loom large. A road movie inspired by Homer's epos, I had missed this Coen brothers film when it first came out. This Mississippi odyssey of three fugitives from justice takes many surprising, not to say improbable, twists and turns before arriving at what must be considered a happy ending by Coen standards. It juxtaposes the best and the worst of Southern life in the USA of the Thirties, and keeps the plot going at a nice clip. Tom Tykwer's latest film is -if maybe not more upbeat than his previous ones- at least less gloomy, and much more like a conventional high-octane thriller. It's set in the world of finance coupled with weapon dealing, except that there's no Bernard Madoff, but several hitmen who waste no time dispatching enemies, friends who have become liabilities, and policemen to the sweet hereafter. Special kudos to Clive Owen, who inherits from Harrison Ford the title "man of a single facial expression". Another Berlinale entry, this film about several colleagues from the same company deals with living personal and professional lives in the cramped spaces of Hong Kong (although many Asian cities could be substituted, as the director remarks). The original Chinese title was Intimacy, which alludes better to the various false starts in which a romance between two of the protagonists (ultimately not) evolves. A great script, excellent location settings and fine acting make this one a winner. An epic biography about Mei Lanfang -China's best-known opera singer during the first half of the 20th century-, I caught it at its international premiere at the Berlinale. In two-and-a-half hours it deals with family life, professional ascendancy, pushing forward the state of opera , consequences of success, the Japanese occupation, and questions of responsibility. The style of opera depicted takes some getting used to, and -given the breadth of material- there isn't much chance to go for depth, so it wasn't my cup of tea. But operaphiles and sinophiles will love it. The movie is entirely shot in one apartment, where a paparazzo and a Jolie fan await the rumored arrival of Brangelina in a nearby house, so that they can shoot pictures of them. In the end, they do arrive, but aren't shown, and at that point it doesn't matter much any more. The film is carried by the conversations of the two protagonists, as well as a stream of slightly out of the normal visitors, including a pizza delivery girl, a girl taking care of the apartment during the owner's absence, all the way to various current and former girlfriends of the owner, all of whom have various ideas about the unexpected presence of the two guys. It's kind of hard to describe, so suffice it to say that it's quite funny and entertaining. Robert de Niro and Jean Reno are at it again, this time as freelancing guns for hire whose mission is to acquire a suitcase of indeterminate content from a group of seriously protected adversaries. As befits a John Frankenheimer movie, there's lots of action and a series of more or less believable plot twists to keep the action going. It's set in France (particularly in the cities of Nice and Paris), which makes for a nice change of pace from the US metropolises where such movies are generally set. Being a table tennis player myself I finally watched this one when a friend lent me the DVD. (I had refused to pay actual money at the theater on account of a goofy-sounding plot.) Turns out I was right. Christopher Walken is as scarily weird as Maggie Q is cute (even more so with her skimpy clothes), but that's about all the enjoyment I got out of it. The humor is of a kind that may be funny after 6 to 12 beers, but not before that. The plot is indeed goofy, but this is not the kind of movie where that matters. Oh, and if you see it: it has really nothing to do with table tennis as it is known in the real world. Woody Allen is at it again, this time in Barcelona, with a great cast that includes -once again- Scarlett Johansson and recent Oscar winner Javier Bardem. Only this time he's the romantic lead, not a hit man. While lots of clichés are served up about men, women, Americans, Spaniards etc., the plot mixes them well, and also makes room for discussions about life, love, art, architecture and philosophy. And lest anyone thinks it's all too heady, plenty of action and confusion ensues, inside and outside of the bedroom.